hd2Line Pro stands for the proven well-known generation of multi standard HDTV Broadcast Monitors, utilizing high quality video and audio processing hardware combined with state of the art LC display technology. hd2Line Pro delivers the performance and features broadcast professionals request: robustness, stability, color accuracy, precise imaging, and picture quality. 480i/29.97, 576i/25, 720p/50 and 720p/60, 10-bit/12-bit RGB 4:4:4, 1080psf/23.98, 1080p/23.98, 1080psf/24, 1080p/24, 1080psf/25, 1080p/25, 1080i/25, 1080psf/30, 1080p/30 and 1080i/30(29.97), 10-bit 4:2:2 1080p/50 and 1080p/60(59.94). The hd2Line Pro series monitors use a modular slot design concept. Optional input boards can be installed in any of the three available slots and in almost any combination, according to the individual needs. Installed boards are automatically recognized by the system without having to reconfigure the device. Multiple audio I/O modules complement the range of available options, including discrete analog or digital inputs and de-embedded audio outputs. 3840x2160 panel resolution, 16 Bit signal processing, 4x 3G SDI, 2x 3G SDI, 2x HDMI, DP inputs, IMD (In Monitor Display), OSD (On Screen Display, Quad-View, picture modes like A/B split, programmable alarms, protocols like Ember+. All hd2Line Pro displays feature DVI, VGA, and CVBS inputs as a standard. 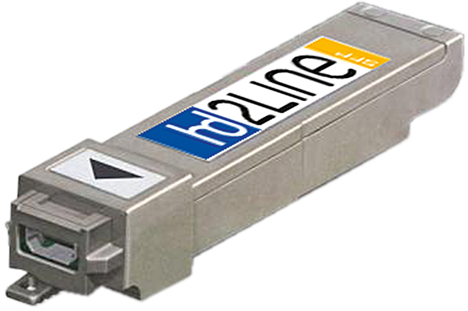 Different multi-format 3G/HD/SD-SDI modules are available with hd2Line SFP support. Accepted signal formats amongst others are: 480i/29.97, 576i/25, 720p/50 and 720p/60, 10-bit/12-bit RGB 4:4:4, 1080psf/23.98, 1080p/23.98, 1080psf/24, 1080p/24, 1080psf/25, 1080p/25, 1080i/25, 1080psf/30, 1080p/30 and 1080i/30(29.97), 10-bit 4:2:2 1080p/50 and 1080p/60(59.94). The hd2Line Pro series monitors use a modular slot design concept. Optional input boards can be installed in any of the three available slots and in almost any combination, according to the individual needs. Installed boards are automatically recognized by the system without having to reconfigure the device. 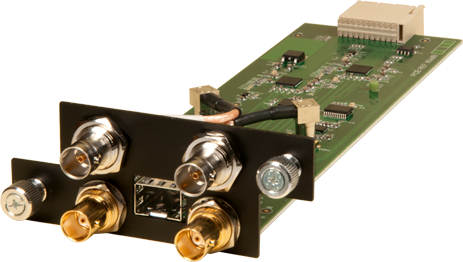 Multiple audio I/O modules complement the range of available options, including discrete analog or digital inputs and de-embedded audio outputs. 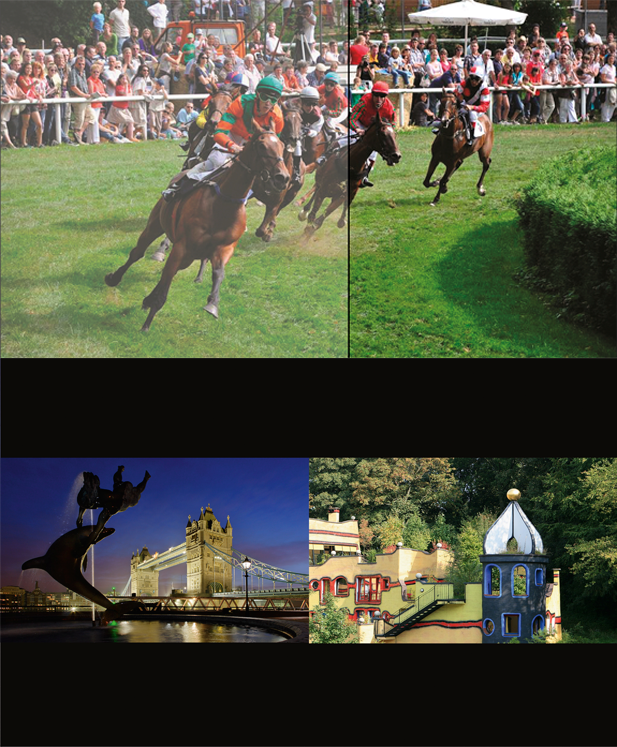 Built into the hd2Line Pro Series – High Performance Broadcast Monitors – the Quad Split option provides a rich featured, yet cost effective solution for monitoring up to 4 video signals on one display. 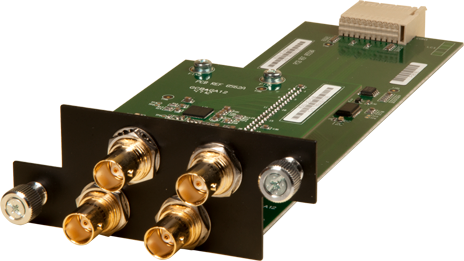 It simultaneously accepts four synchronous or asynchronous 3G/HD/SD SDI signals for a space efficient monitoring solution. 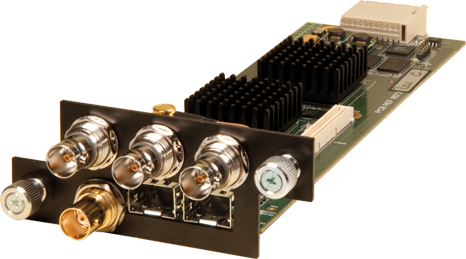 Inputs are auto sensing and additional inputs can be realized using hd2Line SFP modules and an internal router. Input signals can be displayed in any size, position or aspect ratio. Low latency buffering, high quality de-interlacing, advanced high resolution scaling and full resolution of up to 1920 by 1200 pixels perfectly suits the range of hd2Line Pro Monitors. This option can be used in the complete range of monitors, from the small 17 inch all the way up to the large 65 inch. Passthrough mode allows any of the 4 inputs to be selected for full frame output. An extensive selection of controls, available from the local keyboard or remote via network protocol, together with user configurable presets, guarantee the most flexible use in daily operations. hd2Line Pro XSB-B represents the latest generation of Video Wall Broadcast Monitors, featuring a super narrow bezel with a minimum of 1.8 mm thinness (bezel to bezel) for seamless large screens. The XSB-B family allows either horizontal or vertical installation, without any difference in panel lifetime. 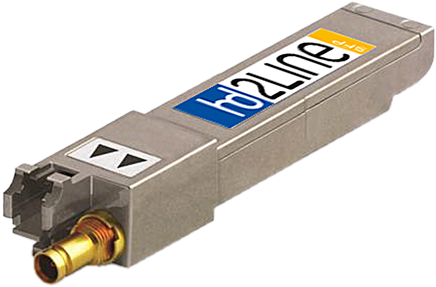 The hd2Line Pro XSB-B Series is based on hd2Line‘s proven high-precision display engine and 10 bit full HD panels, well known for color accuracy, robustness, precise imaging, and picture quality. 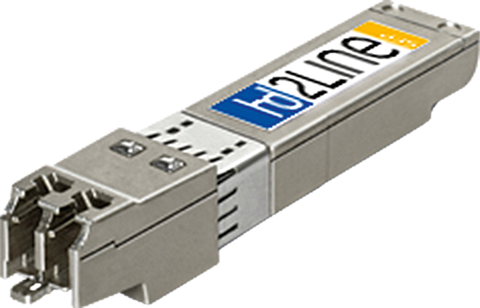 The hd2Line SFP family offers a whole range of SFP modules. 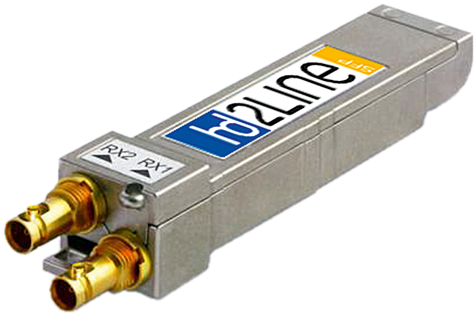 Dual Link HD-SDI formats compliance to SMPTE 372 M. PDP Dual Link supports both Level A and Level B 3Gbps. 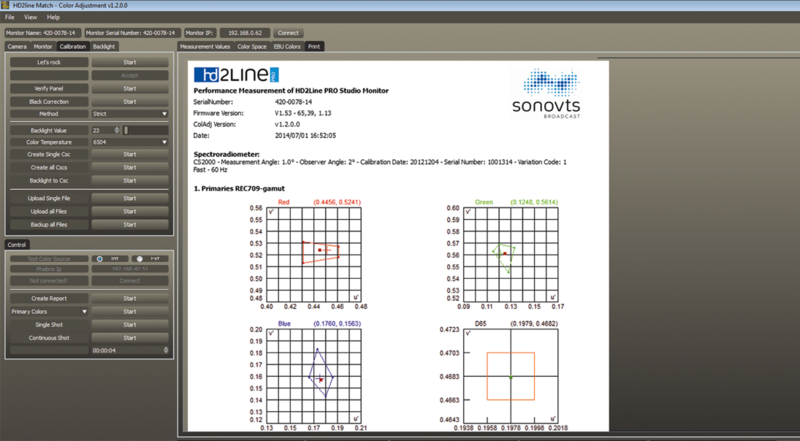 Loudness metering supports ITU-R BS. 1770 (including the new ITU-R BS. 1770-2) and EBU R 128 (including the new EBU R 128 2011) standard. A powerful tool to display two inputs simultaneously on the screen with an incredible amount of different and useful effects. 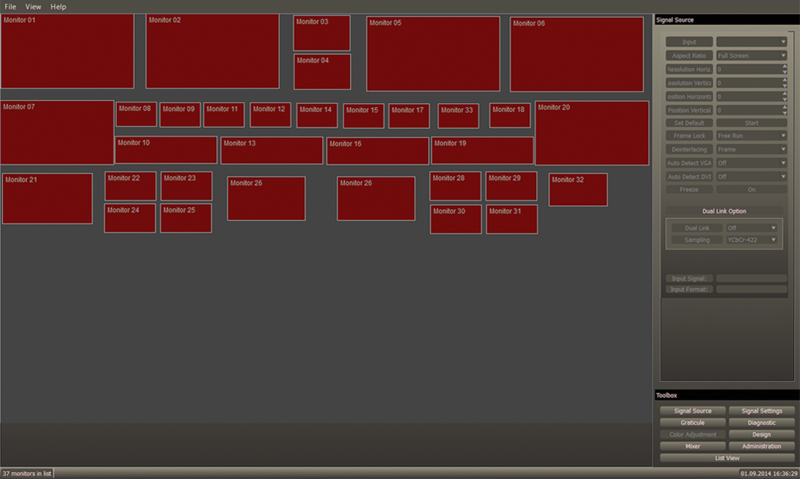 It can blend two sources, wipe between the sources with adjustable boarders and produce side by side pictures. Built into the DCS (Display Control Suite) is also a monitor wall control. 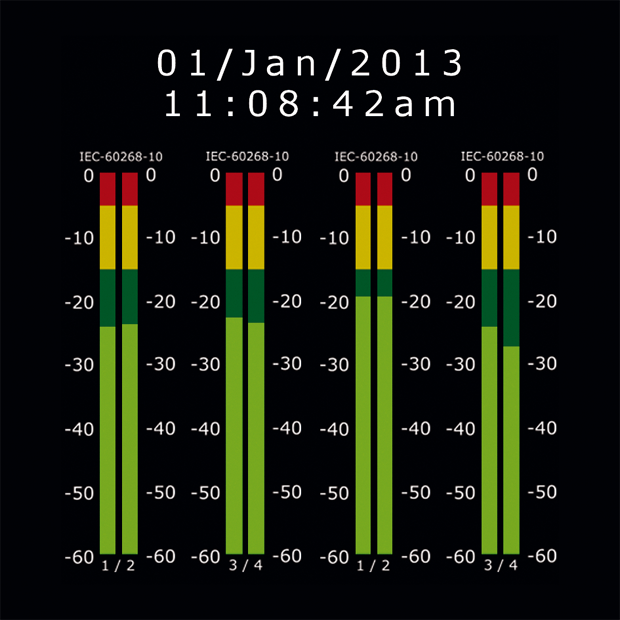 The intuitive and easy to use tool allows online or offline monitor wall configuration. The remote control software gives access to all parameters of all individual monitors as well as predefined groups of monitors in a larger system or an OB van. 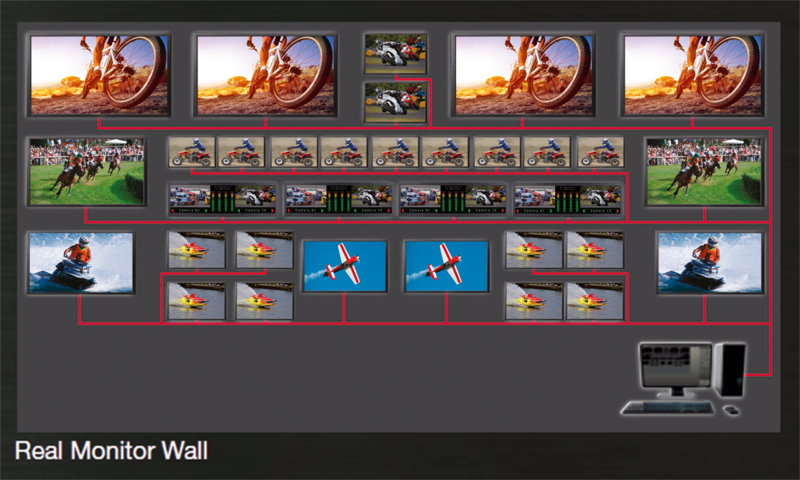 A complex monitor wall can easily be created by drag and drop monitor icons into your layout. 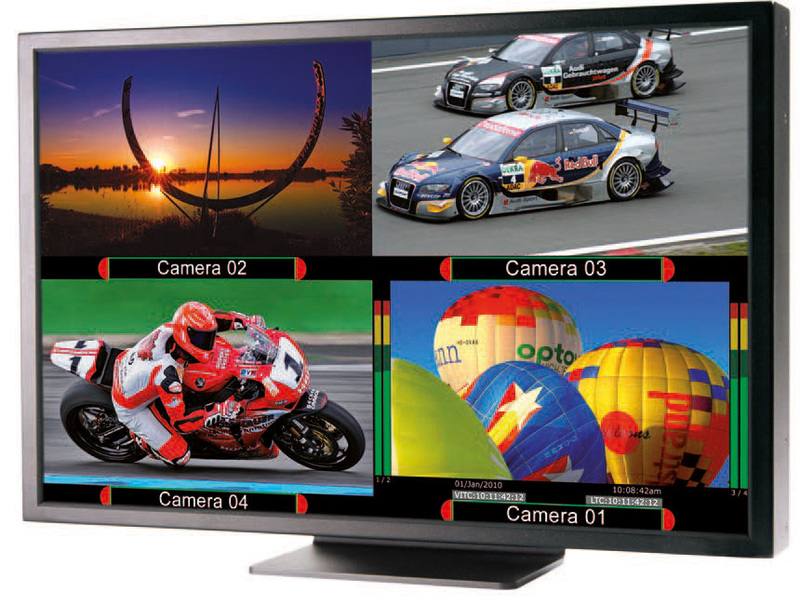 True color reproduction is essential for broadcast applications. 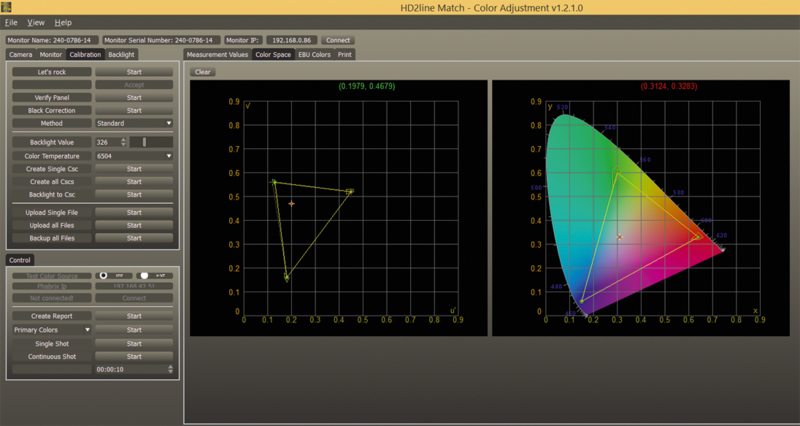 Match – the Color Calibration Plugin for the DCS Remote Control Software is the tool for automatic color space adjustment and guarantees repeatable and precise color reproduction compliant to EBU, SMPTE and ITU. 709 standards. Supports highly accurate spectro radiometer measurement kits like Minolta CS200, CS2000, Klein K-10 or Jeti specbos 1201, etc. 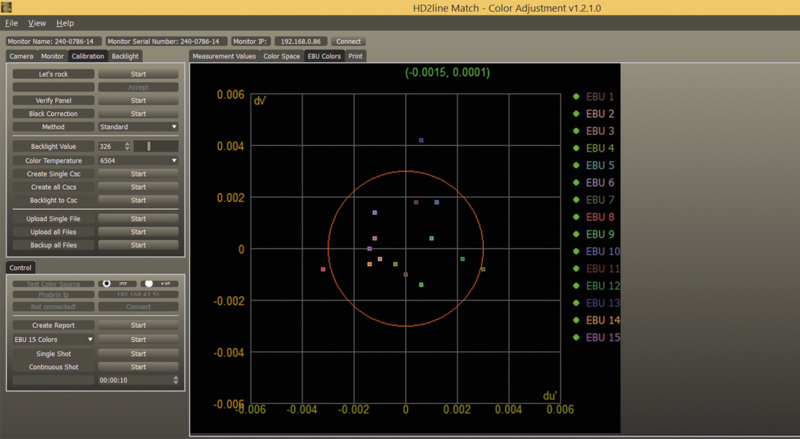 The predefined ‚Calibration Report‘ measures and documents 15 mixed colors (specified in EBU-Tech 3320), the grey values and the primaries red, green and blue.